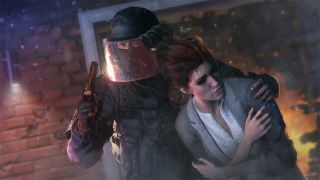 The Rainbow Six Siege multiplayer trailer for E3 shows a team of CTU operators—that's "Counter-Terrorist Unit"—going into action against a squad of goons holed up in a jumbo jet. The trailer is undeniably brief, but it touches on the major points of gameplay: Setting up defenses, investigating and analyzing enemy positions, making plans, executing plans, and executing dudes. When things start to happen, they happen fast. It's short—I wasn't kidding!—but I expect we'll see a lot more at Ubisoft's E3 2015 press conference, which happens today at 6 pm PT. Rainbow Six Siege comes out on October 13.